It’s going to be HOT this weekend! Yes, VERY HOT! 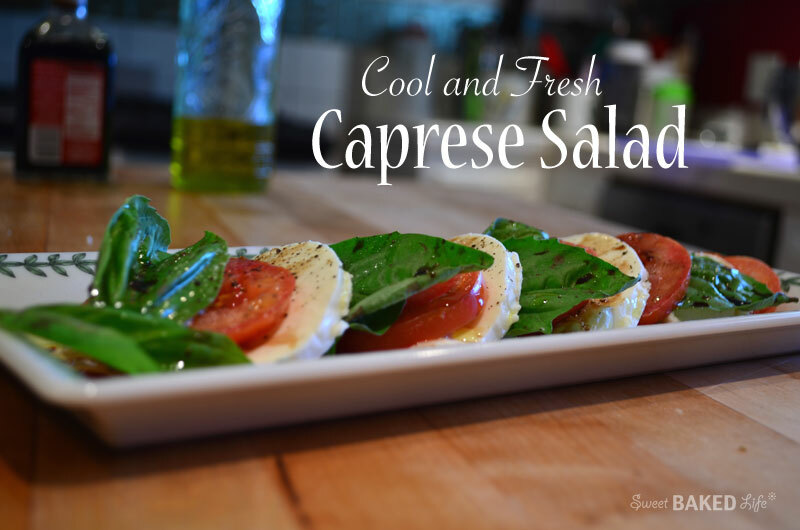 So, if you’re looking for a something quick, easy and tasty to serve your overheated family or friends you’ve got to try this cool and tangy Caprese Salad. It’s a snap to make, and even better to eat! It’s perfect to serve as a light lunch, a refreshing appetizer or as a delicious side to a main meal. Or for that matter, just have it for dinner! The combination of the juicy ripe tomatoes against the creamy cheese and aromatic basil surrounded by fruity olive oil and tangy balsamic is simply irresistible. On a serving platter, place 1 slice of tomato, then top with 1 slice of cheese and 2 basil leaves, repeat slightly overlapping, until you have used all ingredients. Drizzle the olive oil over the top, then do the same with the balsamic vinegar. Sprinkle the top with salt and freshly ground pepper. In my mind, there is no easier salad than this Caprese Salad and nothing beats the combination of wonderfully fresh flavors enjoyed on a hot day!